We are now closed to celebrate Chinese New Year and will be back in the office on Wednesday although the website will still be open as normal. I’d like to wish you all the best of luck in the year of the Pig and for everyone celebrating Chinese New Year, I hope you are safe and surrounded by loved ones. A huge thank you to every single one of you who have been supporting us; this is our 20th year at the Feng Shui Store and we can’t wait for the next 20! 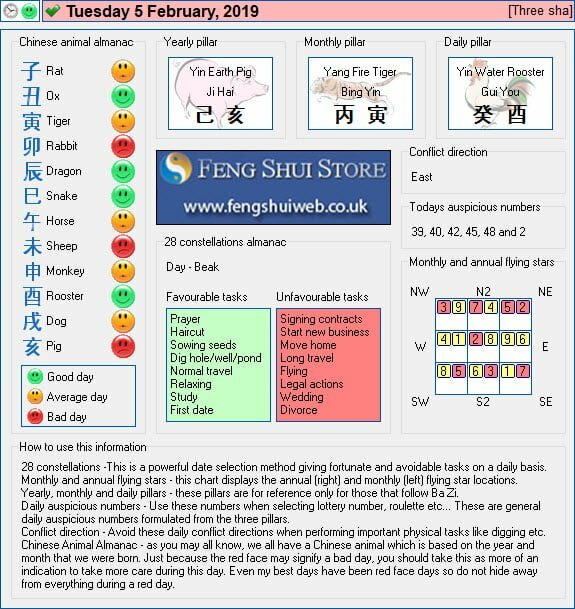 Here is the Free Feng Shui Tong Shu Almanac for Tuesday 5th – Wednesday 6th February 2019. Daniel, Michael, Jo and Laura.